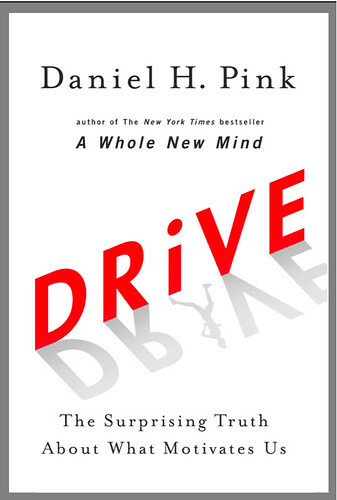 The book: Drive: The Surprising Truth About What Motivates Us by Daniel H. Pink. Amy and I will be there with Pink — and I’m working on some special guests to join the discussion. This is something akin to the Oprah book club. You don’t have to be anywhere — we’ll hold the book club “meeting” right on the air on Federal News Radio 1500 AM’s Daily Debrief with Chris Dorobek and Amy Morris. In addition to the author, Daniel Pink, we will also have some experts in the government world so we can discuss how it touches how this market works. We invite your thoughts, questions and observations on the book — before, during and after. And that brings us to the book — Drive: The Surprising Truth About What Motivates Us by Daniel H. Pink. The crux of the argument in this book is that pay-for-performance systems simply don’t work all that well. It is essentially a carrot-and-stick approach, and there is ample evidence that the carrot-and-stick is actually ade-motivator. A caveat: These are for information age jobs. And he argues that there are better ways to motivate people. Most of us believe that the best way to motivate ourselves and others is with external rewards like money—the carrot-and-stick approach. That’s a mistake, Daniel H. Pink says in, Drive: The Surprising Truth About What Motivates Us, his provocative and persuasive new book. The secret to high performance and satisfaction—at work, at school, and at home—is the deeply human need to direct our own lives, to learn and create new things, and to do better by ourselves and our world. Pink is the author of A Whole New Mind: Why Right-Brainers Will Rule the Future, which I also found fascinating. But this book seems particularly well timed. So… I hope you’ll pick up the book and join in the conversation. I’d love to hear your thoughts on the book.